All Photos by Jim Mason This peaceful retreat lies in the heart of the Flint Hills tallgrass prairie. Purple prairie clover, catclaw sensitive brier, blue false indigo, and yellow prairie coneflower are just a few of the many wildflowers that bloom in the rolling hills around the lake. During spring and fall the lake offers one of the area's few stopovers for migrating ducks-among them American wigeons, blue-winged teal, mallards, buffleheads, lesser scaup, and northern shovelers. Anglers are entertained by painted turtles, bullfrogs, chorus frogs, and by dragonflies cruising the shoreline for small insects. 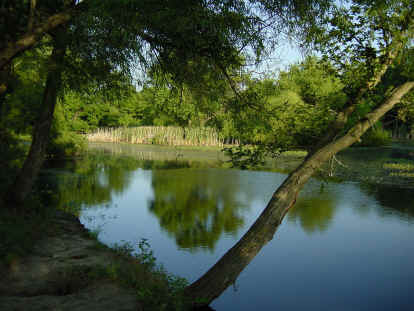 At both ends of the lake, small wooded areas adjoin the North Branch of Rock Creek. Beaver cuttings are evident, as are the bushy leaf nests of fox squirrels. 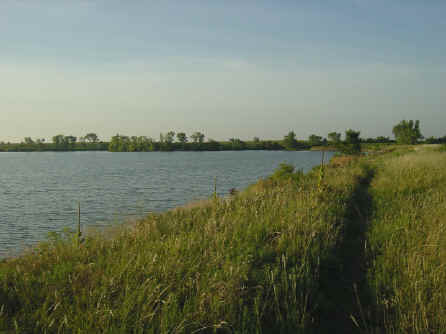 Bobwhites, cardinals, chickadees, woodpeckers, and other woodland birds are concentrated along this riparian corridor. Greater prairie chicken booming grounds (leks) on the surrounding prairie can be located on still spring mornings by driving slowly along country roads at sunrise and stopping frequently to listen for the displaying males. Other prairie birds include upland sandpipers, Henslow's sparrows, common nighthawks, loggerhead shrikes, and eastern meadowlarks. Be alert for deer and coyotes. Bobcats are also here but are seldom seen. Picnic tables, Shelters, Grills, Pit toilets, Boat ramp, Water available. Click the icon to find a birding list for Butler County. Directions: From Latham (~40 miles east of Wichita) go 2 miles west and 1/2 mile north. 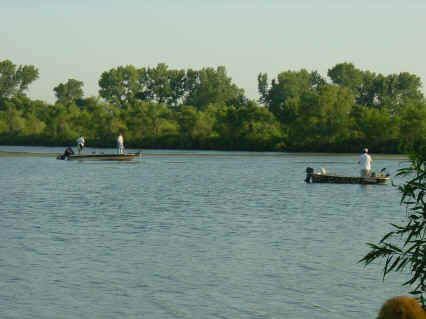 You may download the KDWPT brochure on Butler State Fishing Lake from their web site.